College football has no shortage of rules that should be addressed by the NCAA Football Rules Committee. Targeting and fumbles out of the end zones are just the tipping point to a mountain of rules that could be sorted out, but the NCAA scored some praise last season with an adjustment to the redshirt rule. Now, it’s time for the NCAA to consider revising the transfer rule. According to NCAA rules, players transferring from one FBS program to another are required to sit out a year until they can be ruled eligible to play again. Exceptions can be made with a waiver process under certain conditions, but those exemptions are typically made when a program is under NCAA fire for infractions to the rules. An example of that was Shea Patterson winning an appeal to be able to transfer from Ole Miss to Michigan last year. With the Rebels being hit with NCAA sanctions, Patterson won a battle to be able to play for the Wolverines last fall. The reason this discussion should be getting more traction now is because of the impact of the early signing period. USC is the latest example of why this rule should be adjusted accordingly. After Texas Tech fired Kliff Kingsbury, the former Red Raiders head coach latched on with USC to be the new offensive coordinator under Clay Helton. The addition of an offensive coordinator with the offensive playbook of Kingsbury gave the Trojans a bit of a jolt in recruiting just in time for the early signing day before Christmas at the end of 2018. Among the commitments was wide receiver Bru McCoy, a five-star wide receiver from California. McCoy figured to step right in and be given a chance to add to the USC offense in a system Kingsbury brought with him from the Big 12. Big passing numbers were nearly a sure thing. McCoy was certainly looking forward to getting to meet Kingsbury after he was hired, even before he officially committed to USC. But then a funny thing. After initially being blocked by USC Athletics Director Lynn Swann to be interviewed by NFL teams, Kingsbury was hired to be the head coach of the Arizona Cardinals. With Kingsbury suddenly gone from USC, questions were raised about an already seemingly unstable situation with the Trojans, and that left some players to contemplate whether they wanted to be a part of the program or not. McCoy was among those who decided he already no longer wanted to be a Trojan. 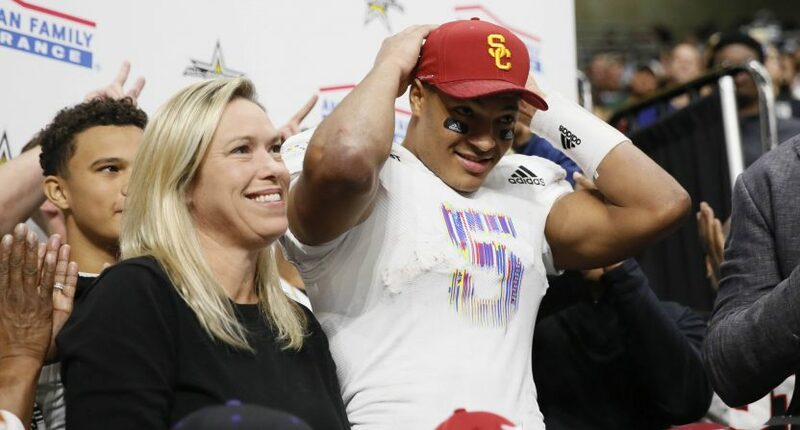 Last week, McCoy was released from his scholarship just days after enrolling in classes at USC. McCoy then committed to Texas and was already making his way to Austin to get started. He flew there over the weekend. Now, all that’s left to determine is if McCoy will be forced to sit out a year this fall or if Texas will be able to get passes to him on the field this season. Officially, McCoy will have to sit out a year even though he’s yet to participate in even one single football practice. Even if the NCAA approves any waiver that may be filed by McCoy and Texas, this would be a good time for the NCAA to change their transfer rules just for situations like this. Simply put, if a player commits to a program only to see a coach or coaches he expected to play for no longer be around after they signed, that player should be given the opportunity to change their minds without any penalty. A player can always burn a redshirt year after a quick transfer, but they shouldn’t have to burn that redshirt year under these circumstances. This may be truer now than ever before as an early signing period may pressure a player to commit early. Coaching changes have always been a problem after the longtime national signing day in February, but an early signing period in the prime coaching carousel season for the NFL and college football assistants is creating more headaches for players in December. Is there a perfect solution to this? Probably not. But providing an outline of exemptions right off the bat that would allow a player to transfer without penalty is in order. If a head coach or assistant coach leaves a program a player committed to, then that player should be allowed to reconsider their decision. It’s a simple solution to a problem that shouldn’t even exist.